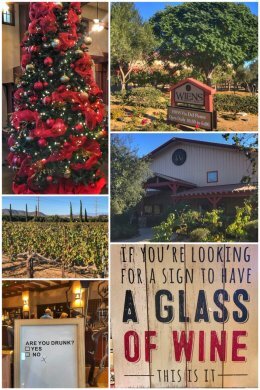 Our last stop this year — before we pick up the trip again right after Christmas — was a return visit to Temecula, CA, for a day of more wine-tasting. Temecula is a bit of a newbie — at least in terms of California winemaking — having started its first commercial vineyard in the late 1960s. Today, there are more than 40 commercial wineries in the Temecula Valley. And be forewarned… for a wine economy that has only been around for 50 years or so, tastings are not cheap — and neither are most of the wines. 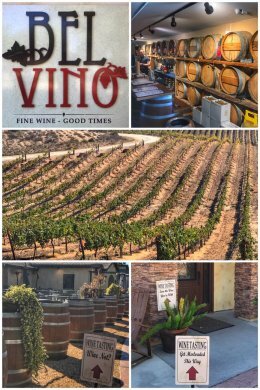 We love wines, but dislike pricey tasting fees — so we tracked down several 2-for-1 tasting coupons and ventured on our way, starting first at Bel Vino Winery, which opened in 1996 and contains 40 acres on a hilltop along Rancho California Road, one of the main winery roads. The tasting room and patio area is fairly sprawling, perhaps partly because they have a very large number of wine club members. (One day we will publish a whole blog on wine clubs!) They offer visitors a choice of wines from their their tasting menu; the winery has a portfolio of 30 to 40 wines — with about 15 or so on the tasting menu. Their wines include highly rated gold medal winners, and we quite enjoyed several of their reds — taking home four to enjoy at a future date. By the way, the winery also has a two-suite Bed and Breakfast for those who want to lounge on the property. Our friendly server at Bel Vino, Christopher, told us the fascinating story of the cabernet sauvignon grape, which we thought was the granddaddy of grapes… nope. It is a fairly new variety, the result of a chance crossing during the 17th century in France between two older grape varietals: Cabernet Franc and Sauvignon Blanc. Cabernet Sauvignon has been one of the most widely planted grapes and one of the most popular premium red wines of the last century — and still today. We love learning stuff like this as we travel the country! We next traveled to Wiens Family Cellars, the “home of big reds,” which has quite a wonderful tasting flight of whites, sparklings, and reds — and we tried some from all three categories. We had a 2-for-1 coupon for Wiens too, and loved that we also were able to keep our complimentary wine glasses. Our only dislike about their beautiful tasting room is that they already had all their Christmas decorations up! We left with a mixed case — with 6 bottles of their delicious Amour De L’Orange Sparkling Wine and 6 bottles of their amazing 2106 Crowded Red Blend… as well as one bottle of their 2017 Merrytage, which we plan to serve at Christmas dinner. We ended our tasting in Temecula at Wilson Creek Winery & Vineyards, which is located at the end of Rancho California Road. Wilson Creek has it all: tasting room, full-service restaurant with vineyard view dining and expansive patio, creekside picnic area, indoor and outdoor conference and event spaces, wedding venue, and exclusive retreat accommodations. We have loved WIlson Creek Almond Sparkling Wine for years — and have also tasted all their other flavors… so on this trip, our server convinced us to skip the bubbly and go on an adventure with their reds. We tasted quite a few reds that were quite nice, but found we loved the 2017 Cabernet Sauvignon-Zinfandel blend the best — jammy, but full-bodied. Our one issue with Wilson Creek — and the many other wineries that sell their products in local, state, or national retail outlets — is why it costs so much more to buy their products at the winery. With no distribution costs and no markup (costs for retailers), it seems logical that wines should cost the least if you purchase directly from the winery… but that never seems to be the case. 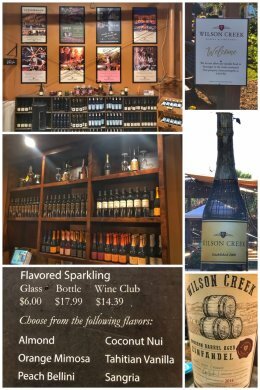 For example, we can buy the WIlson Creek Almond Sparkling Wine for $10-12 a bottle at retail — and yet at the winery, as shown in the picture, it costs $18. Besides the wineries, Temecula offers other distractions, including golf and casinos. Another popular attraction is Old Town, which has buildings from 1800s that house antique stores, retail shops, bars, and restaurants. 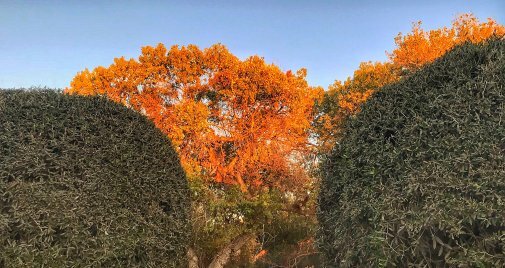 Next up, we take a holiday break in Carlsbad to visit family and friends… but we will still be posting and updating the blog as we prepare to hit the road again on December 26.